We cherish the vibrancy and charm of Huntington village and we are proud of the area’s historic character embodied in various buildings throughout the village. But many feel the village is threatened by fire and redevelopment. The rash of fires (five in the past six months) and proposals for three story buildings in the village may seem alarming, but fire and taller buildings have long been a part of the village scene. In fact, several major fires directly shaped the village of today. The fire that produced the most dramatic change in the village landscape was in October 1869. To understand its impact, you have to understand the early development of Huntington. When Huntington was established in the middle of the seventeenth century, the settlement clustered around the Town Common on Park Avenue. The area we now know as downtown Huntington was marshy and sparsely settled. The area was bisected then as now by Main Street which connected Oyster Bay to the west with the area near the Town Common. Only five other streets existed where downtown Huntington is now. On the north side of Main Street were the road to the west side of the harbor (Wall Street), and the road to Lloyd’s Neck (West Neck Road). To the south there was the road to Long Swamp (New York Avenue). Near the Conklin House, New York Avenue forked to the southwest to reach West Hills (now High Street and Oakwood Road). Finally, Woodbury Road led to the settlement of the same name. Nathaniel Williams’ inn stood on the north side of Main Street, opposite the road to Long Swamp (we now call that road New York Avenue; Long Swamp is the area near the intersection of Depot Road, Maplewood Road and Melville Road). Nathaniel’s son Timothy succeeded his father in running the inn and also operated a store and for a time the post office from the same building. In 1828, Timothy Williams sold the inn to Zophar Oakley, who a few years earlier had purchased property at the northwest corner of Main Street and Wall Street to operate a general store. Oakley’s purchase encompassed 12 acres on the north side of Main Street from Wall Street east to what is now the Trade School property. 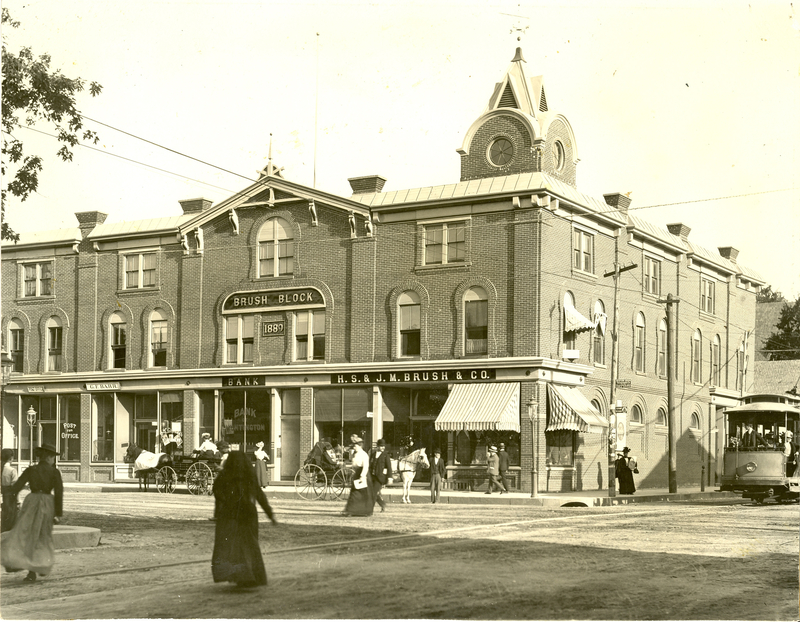 Oakley continued to operate the Williams store, which was a true general store offering a wide variety of merchandise—“almost every article called for in the country.” Oakley prospered at his new location and became a very successful and well-respected merchant. In 1845, he built a house northeast of his new store. The property included a spring fed pond, greenhouses, gardens, and orchards. It was considered one of the garden spots of town. At the southwest corner of his property, along Main Street near Wall Street, Oakley rented stores to other merchants. By the 1850s, this row of stores on the north side of Main Street from Wall Street to what is now New York Avenue was known as the Empire Block. In 1856, Oakley’s son-in-law, Carlos Stuart, and a partner, William A. Conant, took over Oakley’s store and purchased the Empire Block. Less than two years after the sale, Zophar Oakley died. Stuart then gave up his partnership with Conant and transferred his interest in the property to Conant. A year later, Conant, who would later represent Huntington in the State Assembly, sold the property to William Miles of New York City. Miles leased the old store to Baylis & Wells starting in 1862. In 1865, Timothy Baylis purchased the property apparently for his son Hiram Vail Baylis, one of the partners operating the store. Hiram soon gave up the store because of ill health and went into farming. But he held onto the property and rented the store out. Around this time, at the close of the Civil War, the railroad reached Huntington. Previously, the best route to the city markets was by water. The railroad, of course, was located two miles south of the village. It was thought that a direct road connection between the harbor and the railroad station would be desirable. William Conant by now was the area’s representative in the State Assembly. He introduced a bill to create such a link. The new road would also help to drain the marshy land along the route, but would be expensive to build, which arose opposition from residents who would have to foot the bill. A debate also arose concerning the proper location for the road. The most direct route would extend the existing road through the old general store and continue up to the east side of the harbor where the Town dock was located. An alternate suggested route would start the road east of the terminus of the South Road (as New York Avenue was then known), between the Baylis property and Zophar Oakley’s old property now owned by his daughter Catherine and her husband Carlos Stuart. That route would not be conducive to the smooth flow of traffic. There the debate stood until October 1869. On the night of October 13, the circus was in town. The old general store was now run by the Mamlok brothers, who closed the store at 8:00 that night. Perhaps they went to the see the circus. When they arrived back at their store at 12:30 a.m., they were surprised by three thieves, who assaulted them, tied them up, stole their cash ($472), and set fire to the store presumably to cover their crime. The brothers managed to escape. But the fire destroyed their store, the adjoining house of landlord Hiram Baylis and the flour and feed store of Pearsall & Conklin to the west. Other buildings on the block were damaged as well. Baylis began building a new brick house slightly to the east within a couple of weeks. That house still stands on the northeast corner of Main Street and New York Avenue. Conklin also rebuilt his store, but that structure has since been replaced. The most lasting impact of the fire was that it cleared the way for the extension of New York Avenue to the harbor directly across from the existing road. The State Legislature passed the Road Bill on April 22, 1870. The road was still not popular with the local residents. In June they voted 403 to 0 in opposition to the road. But it was too late; construction was well underway. By July 1870 the road extended from the harbor down to Shoemaker Lane—now known as Mill Lane. One of the tenants who lost everything in the 1869 fire was lawyer Thomas Young, who had an office on the second floor. Young eventually moved his office across the street to a block of buildings owned by the Brush Brothers. And there, bad luck followed him. Two decades after the fire that opened the way for the New York Avenue extension, the block on the south side of Main Street east of New York Avenue was occupied by a row of wood frame buildings. On the corner was the general store of Henry S. and James M. Brush. Next was the Bank of Huntington, started by the Brush brothers and Douglass Conklin as a private institution in 1886 and receiving a state charter on July 1, 1888. Then were the stationery store of Edward C. Grumman and the jewelry store of George F. Barr. On the second floor above the stores was the law office of ill-fated lawyer Thomas Young. At the end of the Brush block was the post office and above that the law offices of Charles R. Street, who was the postmaster. To the east of the Brush block were the carriage factory of Ebenezer Jarvis and the harness shop of James B. Scudder and the Second Presbyterian Church. In the early morning hours of Wednesday, September 12, 1888, an employee of the Brush firm noticed smoke rising from the rear of the post office, which was in the middle of the block. He quickly alerted the Brush family who lived in quarters behind their store. The family barely got out of the house in time and took refuge in Hiram Baylis’ house across the street. The night watchman soon discovered the fire and rushed to retrieve the books and papers from the bank. Soon the alarm at the firehouse on Wall Street was sounded. The paints in the Brush store and the oils in the carriage factory accelerated the fire, which quickly spread both east and west. To the west it stopped at New York Avenue; to the east, it spread as far as the Second Presbyterian Church. Seeing that the church could not be saved, residents worked to save the manse next door by covering the wood roof and sides of the building with wet carpets. They were successful. The fire destroyed every building along Main Street from New York Avenue to the manse. Fortunately, many of the contents of the buildings were removed before they too were destroyed. In the aftermath of the fire, the Brush brothers built one of the most imposing structures ever erected in Huntington village. Work commenced the month after the fire and by April of the next year, the three-story brick building was ready to receive tenants. As it turned out most of the former tenants returned to the building from temporary quarters throughout the village. The building still exists, although it has lost its third floor. The third floor on the western one third of the building was removed in 1927, supposedly to make the building more attractive. It may be that the extra space was removed to save on property taxes. The rest of the third floor was removed in 1937 when the Long Island Lighting Company extensively rebuilt that part of the building. The Brush Block was not the first three-story building in the village. The Leaycraft building at the southwest corner of Main Street and New Street (most well known in recent years as the site of Rubin’s Luggage and torn down in 2004) was a three-story brick building erected in 1859. Other prominent three story buildings include the O.S. Sammis building at the northwest corner of Main Street and New York Avenue (built in 1884); the Masonic Lodge on New York Avenue (built in 1905); Gallagher’s Hotel at 25 Wall Street (built in 1908); and the Romano building at 307 Main Street (built in 1909). A fire a few years after the Brush Block fire also resulted in a new three-story building. In 1895, the carriage factory on Green Street was completely destroyed. It was replaced by the three-story brick building that still stands at 7 Green Street. During the building boom of the Roaring Twenties, the three-story Hotel Huntington at the corner of New York Avenue and Fairview Street was built. Two years earlier, another three-story building was built on New York Avenue, the Huntington Office Building. The office building opened on May 1, 1927 “In the center of the growing city.” It featured six stores, a bowling alley and billiard parlor on the first floor; offices on the second and third floors; and the first elevator in town. The building still stands at 375-377 New York Avenue, but without its third floor thanks to a devastating fire in February 1960. The fire was one of three Monday night fires in a two-month period, raising suspicions that an arsonist was to blame. The fire burned for eight hours through the night as firefighters poured three million gallons of water on it. Like other village fires there was no loss of life; although an attorney working late in his office had to be rescued from the roof of the building by an aerial ladder. The next day, the west side of New York Avenue was closed in front of the building due to fears that the ruined shell would collapse. The owner was ordered to either make the building safe or demolish it. He indicated he would demolish it. But three months later, he instead applied for a building permit to partially demolish the gutted building to two stories and rebuild. The building we see today is mostly a reconstruction with only two floors instead of three. In 1964, the building welcomed the newly created district court. The fires of 2014, thankfully, have not been as destructive as some earlier fires. But some, like the March 1 fire at 425 New York Avenue, may result in new three-story buildings. That too would be consistent with Huntington’s earlier building practices (an inspection by the National Board of Underwriters in 1900 revealed that 98% of the buildings in the village were two or three stories high). Whether it will be as welcome as the Brush Block is another question. Thanks for “What’s Old is New Again”. I thoroughly enjoyed this bit of Huntington history. It is not so much that the proposed building across from the former Hotel Huntington will be three stories that bothers me. It is the fact that the drawing made public in the Long Islander shows a really ugly building that does not complement the architecture of the village that is the problem. Many people have said that the new T.D. Bank is not bad – in fact, it is “rather attractive”. What most people do not realize is that the initial proposed building was glass, one story, set way back from Main Street and bore much larger signage. The end product – the inoffensive building we now see – was only after there were objections to the initial proposed building. Local residents must make their opinions heard and then work with members of the planning board to assure that inappropriate architecture will not mar the village for many years to come. I agree Lorraine, size is not necessarily the problem. There still needs to be a design that is consistent with the character of the village. It is hard to judge a design by the picture in the newspaper. The Planning Board does now have architectural review authority. I hope they will use it to ensure good design in the village.